Polychrome digital printing on 220gsm Hahnemuhle Art Duo paper using Canon Lucia inks in a Pixma Pro 9500 Mark 11 printer. 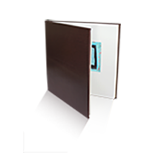 The book is bound as single leaves attached using the split guard system creating sewn sections. The boards are full leather bound in dyed, grained goatskin, with a blind embossed front cover. This unexpected book, the first for seven years and grudgingly welcome in the winter of this creative life, is, in part, a reflection on ‘… the Mandean demon Dinanukht, half man half book, (who) sits by the waters between the worlds reading himself “until the end of time”’. A succession of uncredited texts and quotations, many drawn from my past titles, or otherwise accrued during this book’s making, are deployed as scribbled notes scanned and printed, and sometimes thereafter converted into typographic imagery, fuelling a descent into an oracular womb and the gristled gloom of a faulted embryo. Openings of a one-off, hand-painted book made many a year hence are used both as background and foreground to the above, while graphically exploring, in oil and pencil on paper, a book of openings. These punkish, edgy, onanistic manoeuvres sit in happy discomfort within a monumental binding fit to make the very shelves groan. It is embossed with the legend: ‘You all know the words’.